Acupuncture and herbal medicine have been used for thousands of years by the people of Asia for all types of healing. Most of the patients in the Milwaukee and Waukesha Lake Country area seek out acupuncture to relieve them of chronic pain. The growing interest in Chinese Medicine is very exciting, and more people will gain the additional benefits of acupuncture, massage and herbal medicine. In this web site you will find information about the role acupuncture & Wellness play in natural healing. You will also find additional information about Traditional Chinese Medicine (TCM) and the various modalities used to treat patients. Traditional Chinese Methods provide quality holistic health care to compliment your existing health care. Through the use of acupuncture, herbs, tui na (Chinese massage), diet and nutritional counseling, the body’s innate sense of balance and wellness can be restored. The intention is to treat the body as a whole, and discover the root cause of symptoms in addition to the symptom itself. By using this gentle, proven approach together we can prevent the conditions from re-occurring or worsening after treatment has become completed. It is important to work together, spending as much time as necessary discussing treatment options and listening to your concerns. Finally, as a patient you will never be charged for services or products you do not need! Likewise, it is my policy to refer patients to other practitioners, if necessary, in order to get you feeling your very best. Can Acupuncture Help With My Illness or Issue? Acupuncture originated in China thousands of years ago, but over the past two decades its popularity has grown significantly within the United States. Although some scientists don't fully understand how or why acupuncture works, studies indicate that it provides a number of medical benefits — from reducing pain to helping with chemotherapy-induced nausea and nausea from medical anesthetic. Acupuncture has a long history of use as anesthetic techniques to block pain receptors in areas of the body. Acupuncture therapy usually involves a series of weekly or biweekly treatments in an outpatient setting. It's common to have up to 12 treatments in total. Each visit typically includes an exam and an assessment of your current condition, the insertion of needles, and a discussion about self-care tips. A visit generally lasts about 30 minutes. Before the needles are placed, you'll lie down on a comfortable surface. Depending on where the needles are to go, you will lie facedown, faceup or on your side. Single-use sterile packaged needles are always used. You may feel a brief, sharp sensation when the needle is inserted, but generally the procedure isn't painful. It's common to feel a deep sensation when the needle reaches the correct depth and some people experience pulsing or a sensation of heat which indicates that the energy is flowing and your body is working to heal. After placement, the needles are sometimes moved gently or stimulated with electricity or heat. As many as a dozen needles may need to be placed for each treatment. Once the needles are inserted, they're usually left in place for five to 20 minutes. The traditional Chinese theory behind acupuncture as medical treatment is very different from that of Western medicine. In traditional Chinese medicine, health results form a harmonious balance between the complementary extremes (yin and yang) of the life force known as qi or chi. Qi is believed to flow through pathways (meridians) in your body. These meridians and the energy flow are accessible through more than 350 acupuncture points. Illness results from an imbalance of the forces. By inserting needles into these points in various combinations, acupuncture practitioners believe that your energy flow will rebalance. In contrast, the Western explanation of acupuncture incorporates modern concepts of neuroscience. Many practitioners view the acupuncture points as places to stimulate nerves, muscles and connective tissue. This stimulation appears to boost the activity of your body's natural painkillers and increase blood flow. Acupuncture can be a stand-alone treatment for some conditions, but it's also increasingly being used in conjunction with more conventional Western medical treatments. For example, doctors may combine acupuncture and drugs to control pain and nausea after surgery. Studies indicate that acupuncture offers symptomatic relief for a variety of diseases and conditions, including low back pain, headaches, fibromyalgia, migraines and osteoarthritis. In addition, research shows acupuncture can help manage postoperative dental pain and alleviate chemotherapy-induced nausea and vomiting. Acupuncture also offers relief for chronic menstrual cramps and tennis elbow. Traditional Chinese Medicine (TCM) is like an untapped spring found in nature. It is a positive choice of therapy for anyone who would like to experience holistic healing. Thousands of years of research and practice have evolved into the effective healing system of Traditional Chinese Medicine as we know it today. The goal of this alternative medicine is to keep our body's qi (life force) and blood in a constant free-flow. It helps perpetuate the constant ebb and tide of our yin and yang (heat and cold), which is necessary in maintaining good health. When the balance and flow of qi, blood, yin and yang are disrupted, blockages occur, resulting in disease. To treat disease, needles are applied to acupuncture points that lie on meridians that flow through the body. These meridians are responsible for conducting qi and blood to all of the organs, tissues and limbs of the body. Each organ has it's own meridian in which the qi and blood travel. While coursing through the body, it is possible for these two substances to become stuck or deficient, again throwing off the body's internal balance and resulting in disease. 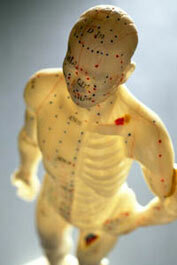 There are 12 main meridians containing anywhere from 9-65 acupuncture points each. Your practitioner will perform a Traditional Chinese Medicine style medical history intake which consists of 10 questions, pulse palpation and tongue inspection. Acupuncture is a nearly painless, holistic procedure. Some discomfort may be experienced, though, it is mild, like a light pinch or mosquito bite. This discomfort is fleeting. During an acupuncture treatment, it is common to feel sensations of heat, pulsing or tingling at the needle sight. This is the qi coursing through the area, and is the desired effect. Most people leave their treatment feeling very relaxed and free of stress. For any health problem, if needles are an issue, these other modalities can be applied to help restore order: acupressure, moxibustion, guasha, cupping, Chinese herbal medicine, tui na (massage) or hands-on energy healing..
A select few may know and respect Traditional Chinese Medicine's benefits to a person's health, but to the Milwaukee area and the world in general, it remains an enigma. The benefits of receiving acupuncture either in conjunction with or as an alternative to western care are boundless. It can relieve stress, chronic pain, sinus blockage, headache and so much more! Many people experience a boost in energy and a stronger immune system after a series of treatments. Most important is the small degree of invasiveness into the body. Surgical procedures permanently mar the cyclical flow of qi in the body resulting in scarring and residual aches and pains, not to mention the decreased flow of qi and blood to the area. Acupuncture can deal less invasively with problems that western doctors would prescribe surgery for such as hip and knee replacements. The insertion of needles around the joint give the benefits of better circulation, swelling reduction and removal of pain. Best of all, no recovery time. The patient does not have to be sentenced to bed rest, missing work, school, or other important events. Another aspect of Traditional Chinese Medicine that is notable is the lack of pharmaceuticals. Physicians today appear to fight every illness wielding a pen and prescription pad. Many medicines may address the symptom, but they do not address the root cause of the symptoms. In addition, pharmaceuticals are notorious for adverse side effects. Treatment with acupuncture & Wellness prove to be much more gentle, and often times more effective. The goal of Traditional Chinese Medicine is to remedy the illness by addressing the root cause in addition to easing the presenting symptoms. Yes studies show that acupuncture can help normalize blood pressure. In other words, it can lower elevated blood pressure or raise pressure when it is too low. Acupuncture may also work alongside conventional treatments for cardiovascular patients. Researchers believe that acupuncture works by relaxing the stiffened vascular system, thereby allowing for the drop in blood pressure. Researchers also found that weekly, 30-minute acupuncture sessions produced substantial pressure reductions of 15 mmHg to 25 mmHg in three to four weeks. Susan Samueli Center for Integrative Medicine at the University of California, Irvine study leader Dr. John Longhurst, said, “We believe these new findings on acupuncture and hypertension will help educate both Western and alternative medical practitioners while encouraging dialog on developing integrative treatment solutions.” Combine several important changes in diet with acupuncture to regulate blood pressure for improved health! Kudos to western medicine for success in diagnostics of severe cases that require surgery. The knowledge of replacing malfunctioning organs and life saving are two shining achievements. However, there are many situations where two therapies can be more effective than one. The combination of eastern and western treatments have proven to be quite synergistic. Modern China is a perfect example of how well these two healing systems can work together. The Traditional Chinese Medicine practitioners there also have an extensive knowledge of western medicine, and use it accordingly. There has been discovered a certain amount of "electrical conductance" at acupuncture sites. Acupuncture "influences the production and distribution of a great many neurotransmitters (substance that transmit nerve impulses to the brain) and neuromodulators (substances produced by neurons which affect neurotransmitters), and this, in turn, alters the perception of pain." For example, to address a pain issue such as tennis elbow or arthritis with acupuncture may be a simpler alternative to western care. A practitioner would perform a physical exam of the area, and perform the ten inquiries of the Traditional Chinese Medicine tradition to come to a diagnosis. The healer then selects a course of treatment best suited to the individual and the illness at hand. Needles would be applied in addition to any other modalities deemed necessary to encourage relief of the symptoms. Herbs may be prescribed to address the root cause of the ailment. Other benefits of this form of healing are that it can reduce swelling and muscle tension, soothe withdrawal symptoms and alleviate insomnia and nervous disorders. There are a number of detox clinics across the country which utilize this gift not only for withdrawal symptoms, but to help restore and cleanse organs that may have been damaged due to substance abuse. The overall benefits of these Traditional Chinese Medicine treatments the patient might find most pleasing are no drugs, no surgery.